The power of refugee resettlement not only to save lives, but to keep families together, is especially poignant with Father’s Day approaching. “Osama and his family sat in the airport in Jordan on January 30, unable to board their flight and unsure what would happen next. They took a bus to reunite with his parents, and Osama went to his old boss to plead for his job back. But on February 4, he received a call: The executive order had been temporarily lifted, allowing Syrian refugees a window to enter the United States. No one knew how long the window would remain open. Would Osama and his family be able to fly out the next day? He and his parents exchanged a second good-bye, then his family took the long flight to the U.S. Ahmed Al Badri, a CRRA caseworker, picked up the family at the Charlotte airport late in the night of February 6. Shortly after they left the airport, Al Badri looked back to see the entire family asleep in the van, exhausted by the journey that had lasted 22 hours—or nearly four years, more accurately, since they left their home in Baba Amr searching for a safe place to live. …[Osama’s] focus, however, is not on hardship but gratitude. He wants to share what it was like to come here and find so many former refugees willing to help his family. 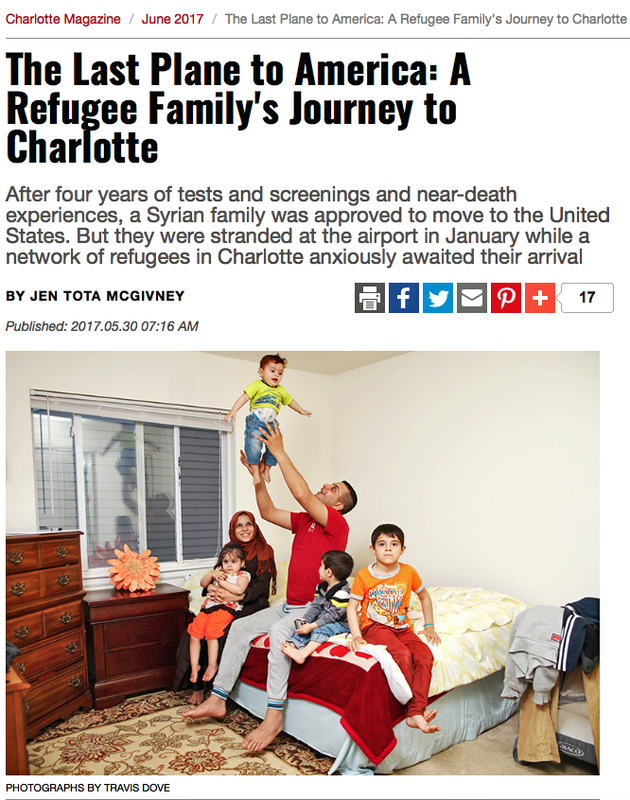 Carolina Refugee Resettlement Agency, HIAS’ local partner in Charlotte, North Carolina, is the agency helping Osama and his family restart their lives, now that they have finally made it to safety here in the United States. In addition to preparing their new home and greeting them at the airport, CRRA’s staff will be the ones who introduce this new family to the ins and outs of American life: everything from paperwork, to doctors’ visits, to getting the kids enrolled in school. Click here to read the full story in Charlotte Magazine. Gabriella Ndawula fled Congo with her family when she was 12, and resettled in the United States in 2013. She’s now an employee at the Carolina Refugee Resettlement Agency. Osama and his family at home in Charlotte, North Carolina.